Translated, by permission, from the net edition of Dagens Nyheter, DN.se. 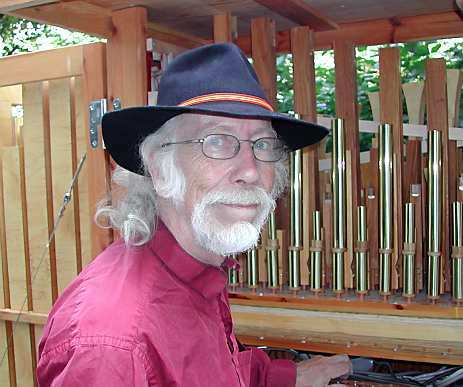 Johan Liljencrants with his feat, the self-playing organ. A big cupboard comes rolling down the sidewalk along Ring Road. At the front a slightly bent man is pulling it. It looks heavy. What is this - a removal? At the Southerman Street corner, the carriage stops and the man unfolds its doors. He bends down, and after a while, the most singular tones are heard from the contraption. He bends down, and after a while, the most singular tones are heard from the contraption. Johan Liljencrants was inspired in Amsterdam. Passers-by stop. Others hurry their steps to see what is going on. Even some cars slow down - because the sound is strong enough to break through the traffic noise. The man adjusts his wide brimmed hat and lights his cutty, obviously content with his self-playing organ and the enthusiasm it raises, not the least in the children. The man in question is Johan Liljencrants and the scene, if not for all the cars, could have been fetched from the century before last. From the organ pipes flows anything from Verdi through ragtime and the Beatles. On one gable is a schematic overview showing how the instrument works; a headline tells that this is 'The JoLi organ - a boy's dream materializing'. So this is a self construction, just recently finished, which took five years to carry through. Liljencrants was inspired in his youth when visiting Amsterdam, where self-playing instruments can be heard here and there in the streets and squares. 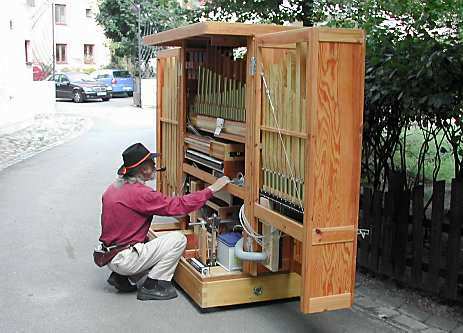 Returning home he made a small busker organ, but could not abandon the thought of a street organ. He was educated as an engineer and became a professor at the Institute of Technology, where he did research in synthetic speech. To have this idea in your mind - and carry it through - you probably must have that type of background. The equally astonished and ignorant visitor to Liljencrants' combined workshop and studio at Dyer's Court Square in North Hammarby Harbour will certainly realize this. Outside the porch door he has an enchanting little garden with a fountain. His apartment is in the same block, close enough that he can wave to his wife. It is in the workshop that the organ is parked and there he sits by the computer making new arrangements for an increasing repertoire. Via Internet he carries on a perpetual, sometimes wild, discussion with other organ builders around the world. There is a conservative trend and one more modern, we understand. “I call the too-tradition-bound people image-makers. For instance some maintain that nothing less than rosewood is good enough for the pipes, while I have shown that just any species will do”, Liljencrants says. He even made pipes from a table leg. 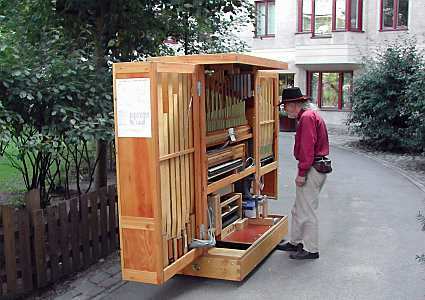 The frame of his organ is made from a couple of old double beds and a wardrobe. This wheeled instrument weighs a hefty 360 kilos and with this materialized boy's dream the 68 year former professor pulls out into the city, mostly on weekends. He has been all the way to Citizen's Square. There it started raining. Luckily a tarpaulin is part of the equipment. And he has plans for getting an auxiliary motor. Johan Liljencrants is also an aquarellist. And he makes little models in bottles. One depicting Stadsgården with boats and harbor buildings would be something for the Town Museum. And he is known as a kite builder. When the School of Decorative Arts arranged kite festivals at Gärdet he could be seen in his characteristic Spanish cloak, almost looking like a kite himself. Now this activity is down and Johan Liljencrants has had other things at hand in recent years. Net note: Those wanting to go into organ building may visit www.fonema.se. © This material is protected by copyright laws.